Sterling by Music Man RAY5 5-String Electric Bass Guitar Satin Blue w/ Gig Bag and Stand by Sterling at Way North of Nashville. MPN: RAY5TBLS BUNDLE. Hurry! Limited time offer. Offer valid only while supplies last. 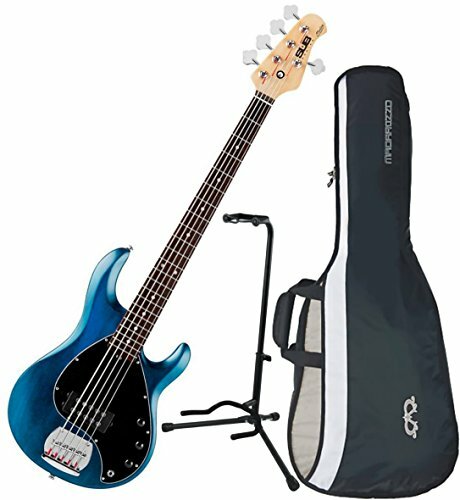 The Ray5 bass is the cousins of the Music Man StingRay 5 bass. Classic, iconic instruments that defined a generation of bassists since the late 70's. The Ray5 bass is the cousins of the Music Man StingRay 5 bass. Classic, iconic instruments that defined a generation of bassists since the late 70's. Active electronics, low noise hum bucking pickups, rock solid hardware and a simple, uncluttered look that is instantly recognizable and respected. Sterling wants your bass to last a lifetime. Superior design and construction are key to delivering a solid instrument that will accompany you on your long musical journey. All S.U.B. basses employ a superior 6 bolt neck joint. The 6 bolt neck joint, designed by Music Man, offers strength, stability and great tone transfer. The neck stays in position and wont shift under heavy load. The neck heel allows easy access to the higher end of the fingerboard and is unobtrusive. Allowing your hands to freely move about the neck with ease. Rest assured, your neck will stay put while your fingers roam about. Includes a Free Bag and Stand!